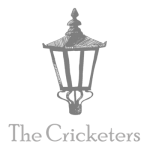 Gather your loved ones, work colleagues, or friends and join us for Christmas at the Cricketers. Our festive menu is a foodie’s delight with some clever and creative twists on classics and inventive dishes from our fantastic kitchen team. We can cater for groups large or small, have an envious location in the Lanes to take advantage of Brighton’s twinkling lights, and why not stay on late afterwards and keep the festive spirit going! Our private rooms upstairs at The Greene Room are also available to hire for your festive function, just get in touch to find out more or visit the Greene Room website.